"Jo, I'm anxious about Beth." "Why, Mother, she has seemed unusually well since the babies came." "It's not her health that troubles me now, it's her spirits. I'm sure there is something on her mind, and I want you to discover what it is." "What makes you think so, Mother?" "She sits alone a good deal, and doesn't talk to her father as much as she used. I found her crying over the babies the other day. When she sings, the songs are always sad ones, and now and then I see a look in her face that I don't understand. This isn't like Beth, and it worries me." "I have tried once or twice, but she either evaded my questions or looked so distressed that I stopped. I never force my children's confidence, and I seldom have to wait for long." Mrs. March glanced at Jo as she spoke, but the face opposite seemed quite unconscious of any secret disquietude but Beth's, and after sewing thoughtfully for a minute, Jo said, "I think she is growing up, and so begins to dream dreams, and have hopes and fears and fidgets, without knowing why or being able to explain them. Why, Mother, Beth's eighteen, but we don't realize it, and treat her like a child, forgetting she's a woman." "So she is. Dear heart, how fast you do grow up," returned her mother with a sigh and a smile. "Can't be helped, Marmee, so you must resign yourself to all sorts of worries, and let your birds hop out of the nest, one by one. I promise never to hop very far, if that is any comfort to you." "It's a great comfort, Jo. I always feel strong when you are at home, now Meg is gone. Beth is too feeble and Amy too young to depend upon, but when the tug comes, you are always ready." "Why, you know I don't mind hard jobs much, and there must always be one scrub in a family. Amy is splendid in fine works and I'm not, but I feel in my element when all the carpets are to be taken up, or half the family fall sick at once. Amy is distinguishing herself abroad, but if anything is amiss at home, I'm your man." "I leave Beth to your hands, then, for she will open her tender little heart to her Jo sooner than to anyone else. Be very kind, and don't let her think anyone watches or talks about; her. If she only would get quite strong and cheerful again, I shouldn't have a wish in the world." "Happy woman! I've got heaps." "My dear, what are they?" "I'll settle Bethy's troubles, and then I'll tell you mine. They are not very wearing, so they'll keep." And Jo stitched away, with a wise nod which set her mother's heart at rest about her for the present at least. While apparently absorbed in her own affairs, Jo watched Beth, and after many conflicting conjectures, finally settled upon one which seemed to explain the change in her. A slight incident gave Jo the clue to the mystery, she thought, and lively fancy, loving heart did the rest. She was affecting to write busily one Saturday afternoon, when she and Beth were alone together. Yet as she scribbled, she kept her eye on her sister, who seemed unusually quiet. Sitting at the window, Beth's work often dropped into her lap, and she leaned her head upon her hand, in a dejected attitude, while her eyes rested on the dull, autumnal landscape. Suddenly some one passed below, whistling like an operatic blackbird, and a voice called out, "All serene! Coming in tonight." Beth started, leaned forward, smiled and nodded, watched the passer-by till his quick tramp died away, then said softly as if to herself, "How strong and well and happy that dear boy looks." "Hum!" said Jo, still intent upon her sister's face, for the bright color faded as quickly as it came, the smile vanished, and presently a tear lay shining on the window ledge. Beth whisked it off, and in her half-averted face read a tender sorrow that made her own eyes fill. Fearing to betray herself, she slipped away, murmuring something about needing more paper. "Mercy on me, Beth loves Laurie!" she said, sitting down in her own room, pale with the shock of the discovery which she believed she had just made. "I never dreamed of such a thing. What will Mother say? I wonder if her..." there Jo stopped and turned scarlet with a sudden thought. "If he shouldn't love back again, how dreadful it would be. He must. I'll make him!" And she shook her head threateningly at the picture of the mischievous- looking boy laughing at her from the wall. "Oh dear, we are growing up with a vengeance. Here's Meg married and a mamma, Amy flourishing away at Paris, and Beth in love. I'm the only one that has sense enough to keep out of mischief." Jo thought intently for a minute with her eyes fixed on the picture, then she smoothed out her wrinkled forehead and said, with a decided nod at the face opposite, "No thank you, sir, you're very charming, but you've no more stability than a weathercock. So you needn't write touching notes and smile in that insinuating way, for it won't do a bit of good, and I won't have it." Then she sighed, and fell into a reverie from which she did not wake till the early twilight sent her down to take new observations, which only confirmed her suspicion. Though Laurie flirted with Amy and joked with Jo, his manner to Beth had always been peculiarly kind and gentle, but so was everybody's. Therefore, no one thought of imagining that he cared more for her than for the others. Indeed, a general impression had prevailed in the family of late that `our boy' was getting fonder than ever of Jo, who, however, wouldn't hear a word upon the subject and scolded violently if anyone dared to suggest it. If they had known the various tender passages which had been nipped in the bud, they would have had the immense satisfaction of saying, "I told you so." But Jo hated `philandering', and wouldn't allow it, always having a joke or a smile ready at the least sign of impending danger. When Laurie first went to college, he fell in love about once a month, but these small flames were as brief as ardent, did no damage, and much amused Jo, who took great interest in the alternations of hop, despair, and resignation, which were confided to her in their weekly conferences. But there came a time when Laurie ceased to worship at many shrines, hinted darkly at one all-absorbing passion, and indulged occasionally in Byronic fits of gloom. Then he avoided the tender subject altogether, wrote philosophical notes to Jo, turned studious, and gave out that he was going to `dig', intending to graduate in a blaze of glory. This suited the young lady better than twilight confidences, tender pressures of the hand, and eloquent glances of the eye, for with Jo, brain developed earlier than heart, and she preferred imaginary heroes to real ones, because when tired of them, the former could be shut up in the tin kitchen till called for, and the latter were less manageable. `spin', and he never disappointed her. But that evening Jo fancied that Beth's eyes rested on the lively, dark face beside her with peculiar pleasure, and that she listened with intense interest to an account of some exciting cricket match, though the phrases, `caught off a tice', `stumped off his ground'', and `the leg hit for three', were as intelligible to her as Sanskrit. She also fancied, having set her heart upon seeing it, that she saw a certain increase of gentleness in Laurie's manner, that he dropped his voice now and then, laughed less than usual, was a little absent--minded, and settled the afghan over Beth's feet with an assiduity that was really almost tender. "Who knows? Stranger things have happened," thought Jo, as she fussed about the room. "She will make quite an angel of him, and he will make life delightfully easy and pleasant for the dear, if they only love each other. I don't see how he can help it, and I do believe he would if the rest of us were out of the way." Now, the old sofa was a regular patriarch of a sofa--long, broad, well-cushioned, and low, a trifle shabby, as well it might be, for the girls had slept and sprawled on it as babies, fished over the back, rode on the arms, and had menageries under it as children, and rested tired heads, dreamed dreams, and listened to tender talk on it as young women. They all loved it, for it was a family refuge, and one corner had always been Jo's favorite lounging place. Among the many pillows that adorned the venerable couch was one, hard, round, covered with prickly horsehair, and furnished with a knobby button at each end. This repulsive pillow was her especial property, being used as a weapon of defense, a barricade, or a stern preventive of too much slumber. "Now, this is filling at the price." "No slang," snapped Jo, slamming down the pillow. But it was too late, there was no room for it, and coasting onto the floor, it disappeared in a most mysterious manner. "Come, Jo, don't be thorny. After studying himself to a skeleton all the week, a fellow deserves petting and ought to get it." "Beth will pet you. I'm busy." "No, she's not to be bothered with me, but you like that sort of thing, unless you've suddenly lost your taste for it. Have you? Do you hate your boy, and want to fire pillows at him?" Anything more wheedlesome than that touching appeal was seldom heard, but Jo quenched `her boy' by turning on him with a stern query, "How many bouquets have you sent Miss Randal this week?" "Not one, upon my word. She's engaged. Now then." "I'm glad of it, that's one of your foolish extravagances, sending flowers and things to girls for whom you don't care two pins," continued Jo reprovingly. "Sensible girls for whom I do care whole papers of pins won't let me send them `flowers and things', so what can I do? My feelings need a` vent'." "Mother doesn't approve of flirting even in fun, and you do flirt desperately, Teddy." "I'd give anything if I could answer, `So do you'. As I can't, I'll merely say that I don't see any harm in that pleasant little game, if all parties understand that it's only play." "Well, it does look pleasant, but I can't learn how it's done. I've tried, because one feels awkward in company not to do as everybody else id doing, but I don't seem to get on", said Jo, forgetting to play mentor. "Take lessons of Amy, she has a regular talent for it." "Yes, she does it very prettily, and never seems to go too far. I suppose it's natural to some people to please without trying, and others to always say and do the wrong thing in the wrong place." "I'm glad you can't flirt. It's really refreshing to see a sensible, straightforward girl, who can be jolly and kind without making a fool of herself. Between ourselves, Jo, some of the girls I know really do go on at such a rate I'm ashamed of them. They don't mean any harm, I'm sure, but if they knew how we fellows talked about them afterward, they'd mend their ways, I fancy." "They do the same, and as their tongues are the sharpest, you fellows get the worst of it, for you are as silly as they, every bit. If you behaved properly, they would, but knowing you like their nonsense, they keep it up, and then you blame them." "Out upon you, fie upon you, Bold-faced jig!" It was impossible to help laughing at the funny conflict between Laurie's chivalrous reluctance to speak ill of womankind, and his very natural dislike of the unfeminine folly of which fashionable society showed him many samples. Jo knew that `young Laurence' was regarded as a most eligible parti by worldly mamas, was much smiled upon by their daughters, and flattered enough by ladies of all ages to make a coxcomb of him, so she watched him rather jealously, fearing he would be spoiled, and rejoiced more than she confessed to find that he still believed in modest girls. Returning suddenly to her admonitory tone, she said, dropping her voice, "If you must have a `went', Teddy, go and devote yourself to one of the `pretty, modest girls' whom you do respect, and not waste your time with the silly ones." "You really advise it?" And Laurie looked at her with an odd mixture of anxiety and merriment in his face. "Yes, I do, but you'd better wait till you are through college, on the whole, and be fitting yourself for the place meantime. You're not half good enough for--well, whoever the modest girl may be." And Jo looked a little queer likewise, for a name had almost escaped her. "That I'm not!" acquiesced Laurie, with an expression of humility quite new to him, as he dropped his eyes and absently wound Jo's apron tassel round his finger. "Mercy on us, this will never do," thought Jo, adding aloud, "Go and sing to me. I'm dying for some music, and always like yours." "I'd rather stay here, thank you." "Well, you can't, there isn't room. Go and make yourself useful, since you are too big to be ornamental. I thought you hated to be tied to a woman's apron string?" retorted Jo, quoting certain rebellious words of his own. "I thought you were asleep," sobbed Beth. "No, it's a new one, but I can bear it." And Beth tried to check her tears. "Tell me all about it, and let me cure it as I often did the other." "You can't, there is no cure." There Beth's voice gave way, and clinging to her sister, she cried so despairingly that Jo was frightened. "Where is it? Shall I call Mother?" "No, no, don't call her, don't tell her. I shall be better soon. Lie down here and `poor' my head. I'll be quiet and go to sleep, indeed I will." Jo obeyed, but as her hand went softly to and fro across Beth's hot forehead and wet eyelids, her heart was very full and she longed to speak. But young as she was, Jo had learned that hearts, like flowers, cannot be rudely handled, but must open naturally, so though she believed she knew the cause of Beth's new pain, she only said, in her tenderest tone, "Does anything trouble you, deary?" "Yes, Jo," after a long pause. "Wouldn't it comfort you to tell me what it is?" "Then I won't ask, but remember, Bethy, that Mother and Jo are always glad to hear and help you, if they can." "I know it. I'll tell you by-and-by." "Is the pain better now?" "Oh, yes, much better, you are so comfortable, Jo." "Go to sleep, dear. I'll stay with you." "You asked me the other day what my wishes were. I'll tell you one of them, Marmee," she began, as they sat along together. "I want to go away somewhere this winter for a change." "Why, Jo?" And her mother looked up quickly, as if the words suggested a double meaning. With her eyes on her work Jo answered soberly, "I want something new. I feel restless and anxious to be seeing, doing, and learning more than I am. I brood too much over my own small affairs, and need stirring up, so as I can be spared this winter, I'd like to hop a little way and try my wings." "To New York. I had a bright idea yesterday, and this is it. You know Mrs. Kirke wrote to you for some respectable young person to teach her children and sew. It's rather hard to find just the thing, but I think I should suit if I tried." "My dear, go out to service in that great boarding house!" And Mrs. March looked surprised, but not displeased. "It's not exactly going out to service, for Mrs. Kirke is your friend--the kindest soul that ever lived--and would make things pleasant for me, I know. Her family is separate from the rest, and no one knows me there. Don't care if they do. It's honest work, and I'm not ashamed of it." "Nor I. But your writing?" "All the better for the change. I shall see and hear new things, get new ideas, and even if I haven't much time there, I shall bring home quantities of material for my rubbish." "May I know the others?" Jo looked up and Jo looked down, then said slowly, with sudden color in her cheeks. "It may be vain and wrong to say it, but--I'm afraid--Laurie is getting too fond of me." "Then you don't care for him in the way it is evident he begins to care for you?' And Mrs. March looked anxious as she put the question. "Mercy, no! I love the dear boy, as I always have, and am immensely proud of him, but as for anything more, it's out of the question." "I'm glad of that, Jo." "Because, dear, I don't think you suited to one another. As friends you are very happy, and your frequent quarrels soon blow over, but I fear you would both rebel if you were mated for life. You are too much alike and too fond of freedom, not to mention hot tempers and strong wills, to get on happily together, in a relation which needs infinite patience and forbearance, as well as love." "That's just the feeling I had, though I couldn't express it. I'm glad you think he is only beginning to care for me. It would trouble me sadly to make him unhappy, for I couldn't fall in love with the dear old fellow merely out of gratitude, could I?" "You are sure of his feeling for you?" The color deepened in Jo's cheeks as she answered, with the look of mingled pleasure, pride, and pain which young girls wear when speaking of first lovers, "I'm afraid it is so, Mother. He hasn't said anything, but he looks a great deal. I think I had better go away before it comes to anything." "I agree with you, and if it can be managed you shall go." Jo looked relieved, and after a pause, said, smiling, "How Mrs. Moffat would wonder at your want of management, if she knew, and how she will rejoice that Annie may still hope." "Yes, she owned she had a trouble, and promised to tell me by-and-by. I said no more, for I think I know it," And Jo told her little story. 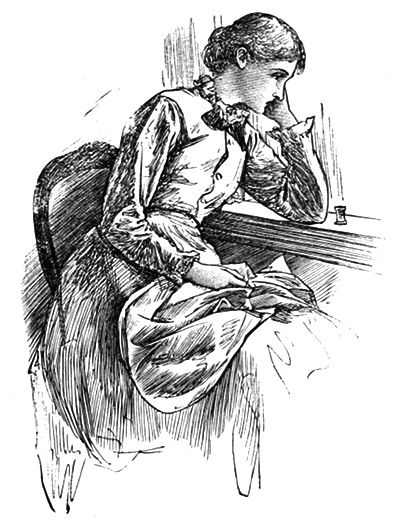 Mrs. March shook her head, and did not take so romantic a view of the case, but looked grave, and repeated her opinion that for Laurie's sake Jo should go away for a time. "Let us say nothing about it to him till the plan is settled, then I'll run away before he can collect his wits and be tragic. Beth must think I'm going to please myself, as I am, for I can't talk about Laurie to her. But she can pet and comfort him after I'm gone, and so cure him of this romantic notion. He's been through so many little trials of the sort, he's used to it, and will soon get over his lovelornity." Jo spoke hopefully, but could not rid herself of the foreboding fear that this `little trial' would be harder than the others, and that Laurie would not get over his `lovelornity' as easily as heretofore. The plan was talked over in a family council and agreed upon, for Mrs. Kirke gladly accepted Jo, and promised to make a pleasant home for her. The teaching would render her independent, and such leisure as she got might be made profitable by writing, while the new scenes and society would be both useful and agreeable. Jo liked the prospect and was eager to be gone, for the home nest was growing too narrow for her restless nature and adventurous spirit. When all was settled, with fear and trembling she told Laurie, but to her surprise he took it very quietly. He had been graver than usual of late, but very pleasant, and when jokingly accused of turning over a new leaf, he answered soberly, "So I am, and I mean this one shall stay turned." "One thing I leave in your especial care," she said, the night before she left. "You mean your papers?" asked Beth. "No, my boy. Be very good to him, won't you?" "Of course I will, but I can't fill your place, and he'll miss you sadly." "It won't hurt him, so remember, I leave him in your charge, to plague, pet, and keep in order." "I'll do my best, for your sake," promised Beth, wondering why Jo looked at her so queerly. When Laurie said good-by, he whispered significantly, "It won't do a bit of good, Jo. My eye is on you, so mind what you do, or I'll come and bring you home."